Carlos Runcie Tanaka, a Peruvian sculptor of what one brief biography called, “of mixed Japanese and European ancestry,” is a star in the international art world. As it happened Mr. Tanaka was in Richmond’s Fan District for a few days in April of 2001. Let me tell you, after watching the sculptor fold and crease a piece of paper in a local bar, I’ve got two words of advice for him — Show Business. This concept would combine the origami with Tanaka’s considerable talent for yarn-spinning. The Baja Bean is a Fan District watering hole located in the basement of what was originally a schoolhouse. The building itself is a stone and brick fortress. It was a typical crowd of mid-week regulars — there were about 20 decidedly adult faces around the three-sided, horseshoe-shaped bar. The group was approximately equal parts white collar, blue color and no collar. When then-chairman of Virginia Commonwealth University’s sculpture department Joe Seipel came in the room, with Carlos Tanaka at his side, Joe was smiling more broadly than usual. Seipel, who enjoys telling a good story, maybe even more loves to present a cool visiting artist to his pals at Happy Hour. It’s a tradition left over from the Texas-Wisconsin Border Café (1982-99), the nearby much-missed saloon which Seipel himself once co-owned. Seipel introduced Carlos to those who hadn’t already met him. Tanaka has done much traveling, owing to his acclaim as an artist. At an art confab somewhere in South America he had met and gotten to know Seipel, plus a couple of other art faculty types at VCU’s world renown fine arts school. Then they arranged for him to come to the art school here as a visiting artist/scholar. That’s how a Peruvian artist ends up in the Bean at beer-thirty. As an aside, Tanaka was among the hostages taken by the Tupac Amaru in that bizarre 1996 incident in Lima, Peru, at the Japanese ambassador’s home. Nonetheless, his experience as the hostage of hell-bent terrorists for 50 days apparently did nothing to diminish his overall sense of humor. Eventually, someone asked him about the crab-folding thing. Someone else supplied a blank sheet of paper. For the next 20 minutes Tanaka told stories, made observations, ad-libbed and entertained everyone on hand. Nothing else was happening in the room for that spell. 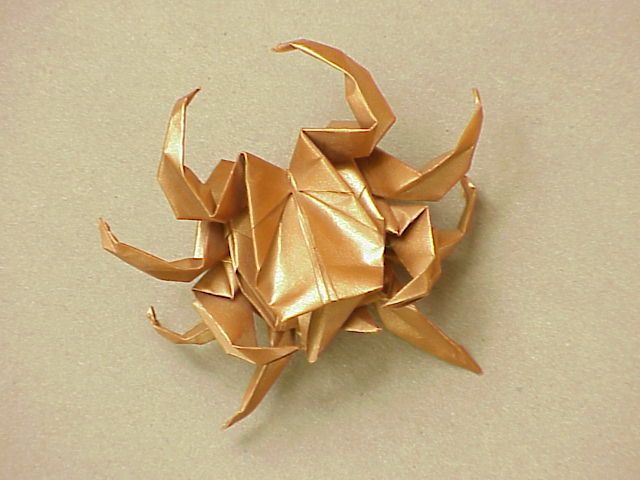 The product was an intricate paper crab made from an ordinary piece of white bond paper. Looking at the crab was fun; it almost seemed cute, for a crab. But watching the artist fold the paper, over and over — each fold exactly where it had to be — as he offered his lighthearted patter, like a pro, was a rare treat. To the delight of the person who had supplied the sheet of paper, the crab-folder gave it to them. Of course, someone else had to have one, too. Then another. Tanaka must have folded four or five paper crabs that afternoon. He never ran out of offbeat stories about drinking, playing practical jokes, making art, fools in high places, and so forth. By the way, the upbeat Tanaka never mentioned the dark time he was a hostage. I found out about that later. The next time I saw Carlos in the Bean, a couple of days later, he gave me a paper crab as a souvenir. Soon afterward he went back to Peru. As he’d been away from his studio for months, traveling and lecturing, the artist had said he was glad to be going home. I haven’t seen him since. Occasionally I do see Tanaka’s name associated with a big art happening in South America or Europe. Last year he did his visiting sage routine at the University of Cincinnati. So, what’s that “mixed ancestry” business mean? It seems one of Tanaka’s grandfathers was British, the other was Japanese. Both men married Peruvian women.